Our first week is now complete. The botanists and Andrew our photographer went to Príncipe early so I will include their progress in a later blog. 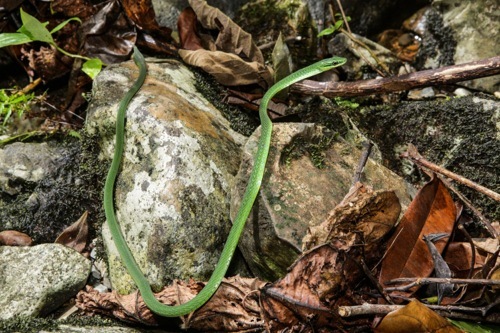 One thing I will add though is a picture Andrew emailed us yesterday, a shot of the endemic diurnal green snake, the Príncipe Soá-soá. 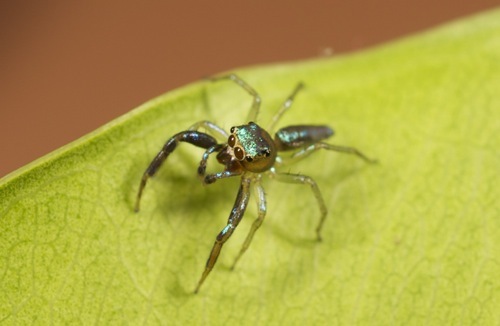 We have only been able to collect one of these (GG I); it is an extremely elusive species. Signe Mikulane, a PhD student at the University of Heidelberg had been in contact with me during the past few months and delayed her return to Germany to be with us for a week. 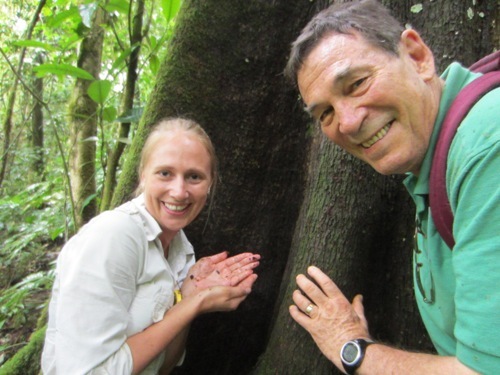 She joined us in our early school visits, and especially our annual check of the status of the large tree where we find the Sao Tome giant treefrog. We found no adults but Signe dug her hand into the tree hole and came up with tadpoles, so we know the tree is still in use. In the picture above, there are several tadpoles in her hands. 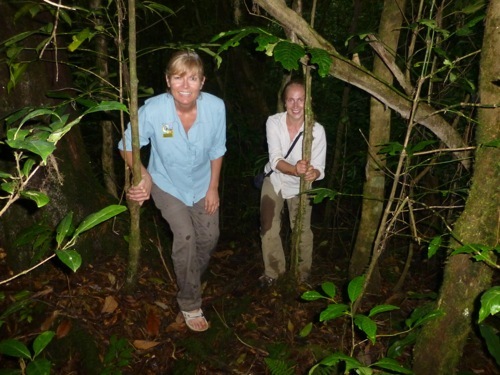 With the arrival of Roberta Ayres (and Dr. Szuts) the biodiversity education team was complete. Saturday we held our first ever teacher workshop at Escola Primaria Maria de Jesus, the largest primary school in the country (2,000+ kids). We spoke to 58 teachers about island biodiversity in more depth so that they can use the materials we have brought more efficiently. The hour and a half presentation was extremely well received, even though we had to project our powerpoint on the back of a canvas painting! Although we are concentrating on fourth grade this year, the teachers were from all grades and we have already noticed that our materials, the posters, the coloring books, etc. are used widely at many different levels. 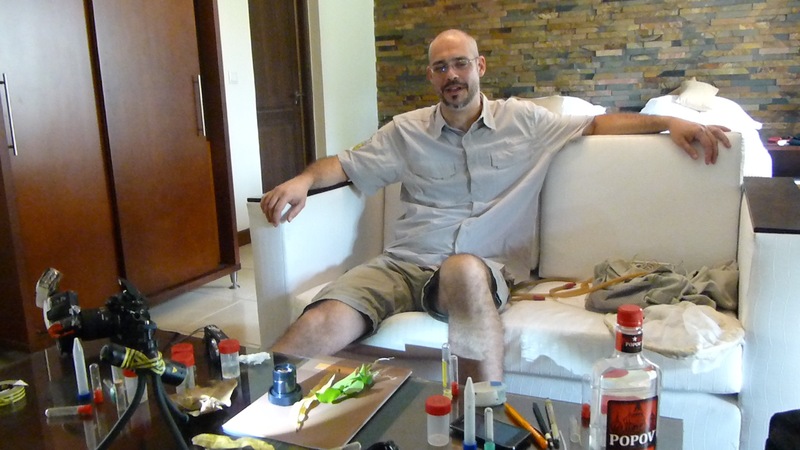 Dr. Tamas Szuts, Professor of Biology at the University of West Hungary is our jumping spider expert. 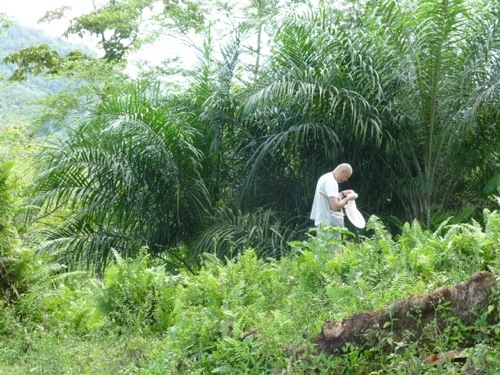 We took him into the field early, to the south end of the island and he began collecting. By the way, these pictures do not do Tamas justice. He is about 6’ 8” tall. He brings specimens back live and then photographs them in great detail. 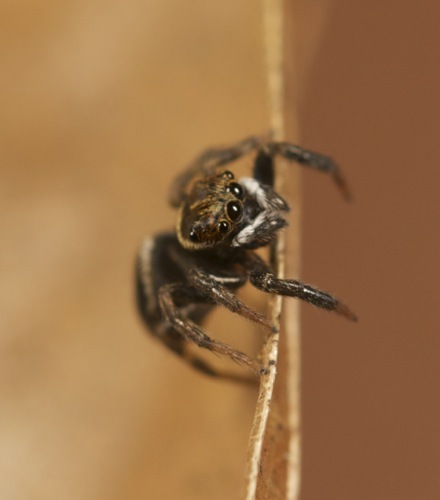 The second two images are salticid, or jumping spiders; the first is of a different group. More soon when Rayna, our frog student arrives and we reunite with the rest of the science team. We are most grateful to Arlindo de Ceita Carvalho, Director General, Victor Bomfim, and Salvador Sousa Pontes of the Ministry of Environment, Republic of São Tomé and Príncipe for their continuing authorization to collect and export specimens for study, and to Ned Seligman, Roberta dos Santos and Quintino Quade of STePUP of Sao Tome http://www.stepup.st/, our “home away from home”. We gratefully acknowledge the support of the G. Lindsay Field Research Fund, Hagey Research Venture Fund of the California Academy of Sciences for largely funding our initial two expeditions (GG I, II). The Société de Conservation et Développement (SCD) and Africa’s Eden provided logistics, ground transportation and lodging (GG III-V), and special thanks for the generosity of private individuals who made the GG III-V expeditions possible: George G. Breed, Gerry F. Ohrstrom, Timothy M. Muller, Mrs. W. H. V. Brooke, Mr. and Mrs. Michael Murakami, Hon. Richard C. Livermore, Prof. & Mrs. Evan C. Evans III, Mr. and Mrs. Robert M. Taylor, Velma and Michael Schnoll, and Sheila Farr Nielsen; GG VI supporters include Bom Bom Island and the Omali Lodge for logistics and lodging, The Herbst Foundation, The “Blackhawk Gang,” the Docent Council of the California Academy of Sciences in honor of Kathleen Lilienthal, Bernard S. Schulte, Corinne W. Abel, Prof. & Mrs. Evan C. Evans III, Mr. and Mrs. John Sears, John S. Livermore and Elton Welke. GG VII has been funded by a very generous grant from The William K. Bowes Jr. Foundation, and substantial donations from Mrs. W.H.V.“D.A.” Brooke, Thomas B. Livermore, Rod C. M. Hall, Timothy M. Muller, Prof. and Mrs. Evan C. Evans, Mr. and Mrs. John L. Sullivan Jr., Clarence G. Donahue, Mr. and Mrs. John Sears, and a heartening number of “Coolies”, “Blackhawk Gang” returnees and members of the Academy Docent Council. Once again we are deeply grateful for the continued support of the Omali Lodge (São Tomé) and Bom Bom Island (Príncipe) for both logistics and lodging and especially for sponsoring part our education efforts for GG VII. Our first contingent of six participants is leaving for São Tomé and Príncipe in about a week, with three additional joining us a week or two later. As preparations continue, I want to reiterate the educational part of our on-going mission. Readers will already know that big changes are coming to these two ancient and fascinating islands, mostly due to the discovery of oil within their Exclusive Economic Zone. At the same time, the inhabitants of the island, a little less than 200,000 in number, are largely unaware of how biologically unique their islands are (as is much of the world, hence this blog and our 20+ scientific publications). 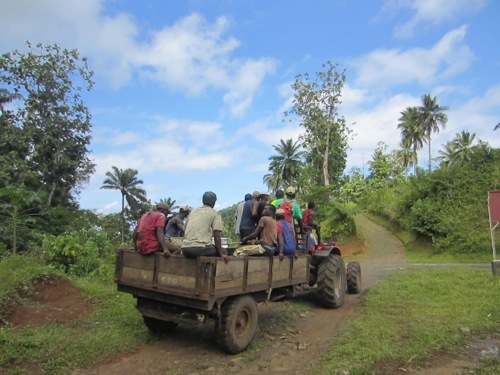 During GG IV, 2010, we assessed the level of biodiversity training in the local schools and decided to embark on a biodiversity education campaign. Obviously, our small group cannot do this alone, nor should we, and so in describing our efforts so far, I must include some of the amazing citizens who have been and remain essential to our success. Three of our most important local educators (and close friends) are Roberta dos Santos, Quintino Cabral Quade and Ned Seligman. I have known Ned since childhood in San Francisco, and it was at his urging that I first visited the islands in 2000. He introduced me to Roberta and Quintino both of whom worked for his NGO at the time. Quintino took us all over the island and I was hooked. Ned has had more than 25 years experience working with grassroots development organizations in Africa and was the Peace Corps Director in São Tomé and Príncipe for 3 years in the mid 1990’s. Before setting up STeP UP, a local development NGO on São Tomé, he worked for the World Wildlife Fund, World Learning, Catholic Relief Services, the American Friends Service Committee and the PeaceCorps. He received his B.A. from Yale University and a Masters Degree from Johns Hopkins University Ned is the founder and Director of STeP UP with which our educational work is closely associated. Ned’s house on Praia Francesa is our unofficial “home away from home.” His lunch salads are legendary! Roberta dos Santos is a member of a very old São Tomé family. As a young girl, she was selected as a member of a group of São Tomeans to travel to the US to learn to teach English as a foreign language. 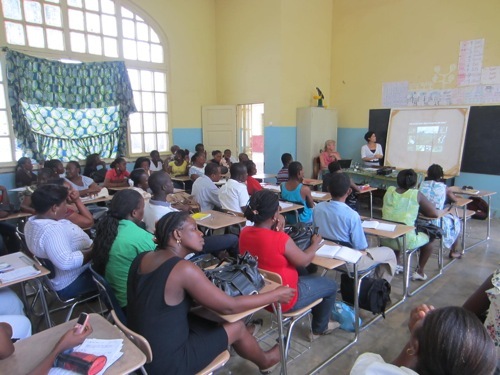 Roberta has worked with community-based organizations in São Tomé since 1990, when she started working for the Peace Corps as Assistant Director. 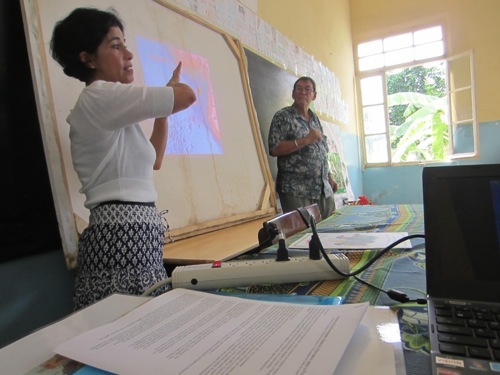 Prior to the Peace Corps, she taught English for twenty years in São Tomé’s only high school and later at the Diocesan Institute Joao Paulo II. She received advanced training in TEFL for three years in Buffalo, NY. 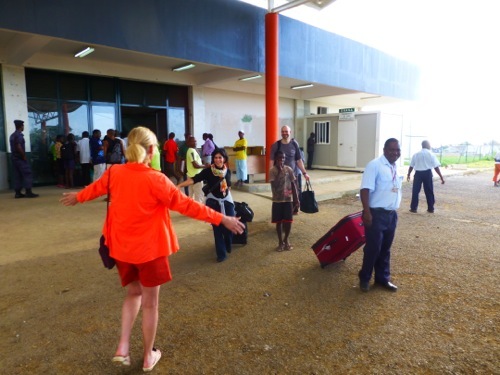 Having been born and raised on the hot tropical island of São Tomé, Roberta’s description of landing for the first time in Buffalo, New York in February, the dead of winter, is truly hysterical. She is well known in the educational community, has helped us plan our school visits and vetted our educational materials. She and Quintino usually join our school visits as translators. Quintino Quade graduated from the Teacher Training Institute “Tchico Te” in 1993 and was a teacher, first in a middle school and later in a high school in Bissau, the capital of Guinea-Bissau. During the war in that country, he emigrated to São Tomé and has been working with STeP UP since 1999. Quintino has been teaching English at the SAPEL school for many years, but he has also accompanied us and been actively involved in all of our scientific expeditions since the very beginning. During GG V, we were most fortunate to meet Jorge Bom Jesus, Director of the Teacher Training institute and currently Minister of Education and Culture. Together we discussed the possibility of future Biodiversity training workshops for teachers at the Institute. One of our strongest supporters and wisest counselors is Henrique Pinto da Costa. Henrique is a former Minister of Agriculture and has always been interested in youth development; we discuss most of our education ideas with him. He is the brother of the current President of the Republic, Manuel Pinto da Costa. 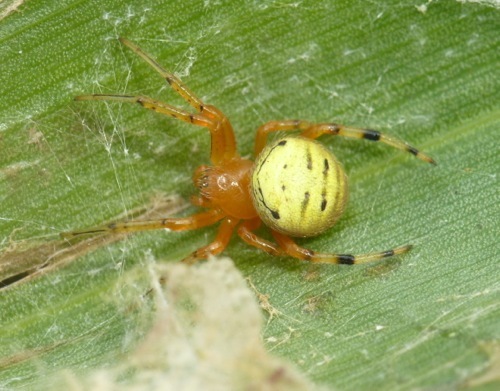 We actually captured an endemic spider in his garden (see Sept 2, 2011 blog). During GG V, the poster year, we met Francisca de Ceita, Principal of the largest primary school on São Tomé (2500 students). She welcomed us to her school during GG VI, where we distributed 534 coloring books to 16 classes of third grade students. Francisca de Ceita, Principal of São Tomé’s largest primary school. A. Stanbridge phot. GG V.
Our biodiversity education and scientific activities have always received tjeenthusiastic support of the Regional Present of Príncipe, Jose Cassandra. We meet with him each year and inform him of our activities. Discussing the coloring book campaign with Regional President of Príncipe Jose Cassandra (center) and Secretary of Infrastructure Nestor Umbellina (right). A. Stanbridge phot. GG VI. During GG VI, we met the Director of Education and Health for Principe, Natalia Umbellina, and she helped us coordinate our visits to the schools of that island. During GG VI, we visited 40schools, 67 classrooms and distributed 1823 coloring books to third graders. In GG VII, beginning in April, our education team intends to visit the same classes in the same schools on both islands, only now the children will be fourth graders. Our educators, Velma Schnoll and Roberta Ayers have developed a series of games for the students to play at the same time increasing their awareness of the unique fauna and flora of both islands. Velma Schnoll, Bioeducation Coordinator (above) showing the cards to third graders at McKinley Elementary School in San Francisco. She is in the process of setting up a letter exchange between these students and the students of Porto Real, my adopted school on Principe. Why kids, you ask? I call it the “Ray Kroc model”.. For those of you who remember, Ray Kroc did not create McDonalds, the world’s most successful food chain, by advertising to adults–he advertised to the kids! Angus Gascoigne at Roça Abade, Príncipe. phot Carlos Pinheiro. Angus Gascoigne died just last year; he was the foremost resident naturalist on the islands and an enormous help to both our scientists and investigators from around the world.